Revital Fertilisers Taranaki has secured the Chapple Cup for the first time in 10 years, this will now take pride of place in the trophy cabinet along side the Furlong Cup which the side won last season. 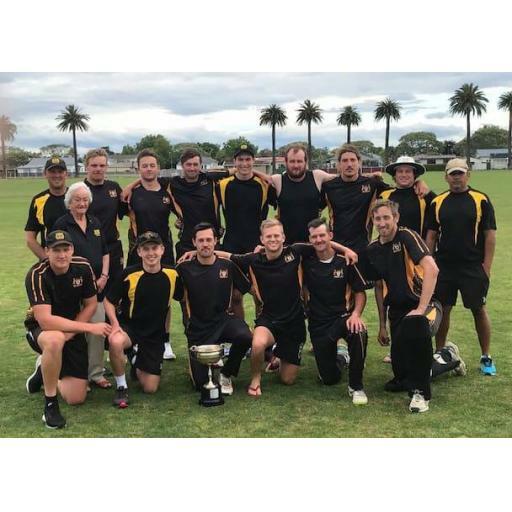 The 50 over competition for all CD Districts is played in Napier over 3 days, on day one Taranaki went up against Whanganui, batting first Taranaki made a steady start with Taranaki Associated Cleaners Dean Robinson and Jesse Vertongen putting on 53 for the first wicket. When they both departed it was left to Shaun Sullivan and Liam Muggeridge who combined for a 104 run partnership with Sullivan bringing up his maiden century for Taranaki finishing on 104, his innings was off 112 balls and included 11 boundaries and one six. Muggeridge made 50 and Kaylum Boshier finished the innings off with a well hit 37 off 23 balls, Taranaki ending on 286 for 7. Whanganui were never in the hunt being bowled out for 192 inside 44 overs with the NPMU duo of Daniel Burnet and Jacob Richards both picking up 3 wickets. In the semi final Taranaki were up against Manawatu and looking for some revenge after their Furlong Cup defeat to them only one week ago. Once again Taranaki batted first and set up a competitive total of 246 for 6 with Liam Muggeridge scoring another half century and Eltham Vet Services Phil Barraclough finishing on 72 not out. Manawatu looked to be cruising at 146 for 2 with 19 overs remaining but the left arm spin duo of Daniel Burnet and Mattie Thomas put a stop to it with Burnet picking up 4 wickets and Thomas 3. Manwatu finsihing 25 runs short which saw Taranaki move on to the final against Hawkes Bay. Hawkes Bay won the toss and elected to bat first, a decision that they would have regretted 3rd ball of the day as India Todays Ryan Watson had Hawkes Bay opener Bayley Wiggins trapped in front. From there the Taranaki bowlers continued to apply the pressure with some tight bowling. Taranaki eventually dismissed Hawkes Bay for 189. Davis Mills picking up 3 for 32 and India Today Watson 3 for 44. In reply the Taranaki openers made a cautious start and it was Jesse Vertongen who went first in the 10th over with the score at 38. Shaun Sullivan joined Taranaki Associated Cleaners Dean Robinson at the crease as they went about their work in a methodical fashion as they put on a 84 run partnership with Sullivan departing for 34 with the score at 122. If there were any nerves in the Taranaki camp Robinsons soon dispelled them showing his experience and class as he anchored the innings and time the run chase to perfection seeing Taranaki home in the 48th over for the loss of five wickets. Robinson hitting the winning runs and bringing up his 2nd century of the season and his 11th of his career for Taranaki ending on 104 not out, the innings included 13 4’s and 1 maximum.